Online slot games are developed to entertain people by providing them with some money-making opportunities, but this time, NextGen gaming has done something different. It has developed a video slot Psycho based on a 1960’s horror movie. Alfred Hitchcock had succeeded in scaring people and you can feel the same chills in NextGen Gaming’s new 5×3 reel and 25-payline video slot. You can start playing at 25p and increase the bet size as the game progresses. This video slot features free spin bonus rounds that offer up to 20 free spins. This scary video slot features superb animations and all the more scary background audios. Ultimately, you will find it quite entertaining if you love to watch horror movies. 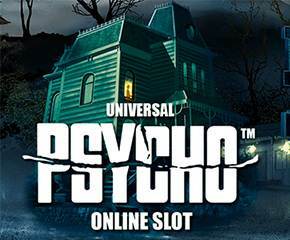 As mentioned above, Psycho video slot is based on Alfred Hitchcock’s famous horror movie, so you can expect some scary animations in the background. There is an isolated house on the top of the hill, where the slot reels are set inside the house. Bats wander around the reel and you experience some thrilling audio effects and it rains continuously when the game is on. Someone appears behind the window and he wanders around the reel like she is observing the location and waiting for the guests. The game progresses on a scary location and NextGen gaming has applied high-quality graphics to improve the thrill while gambling. Symbols that reward high prize are a door key, a peephole, Norman, Bates, Marion Crane, and an envelope. Other symbols are standard slot game symbols, which don’t provide higher wins. Big Blood Red Wild is the wild symbol in this game. Wild can substitute other symbols of the reel, except the scatter. The scary view of the house is the scatter that triggers free spins. 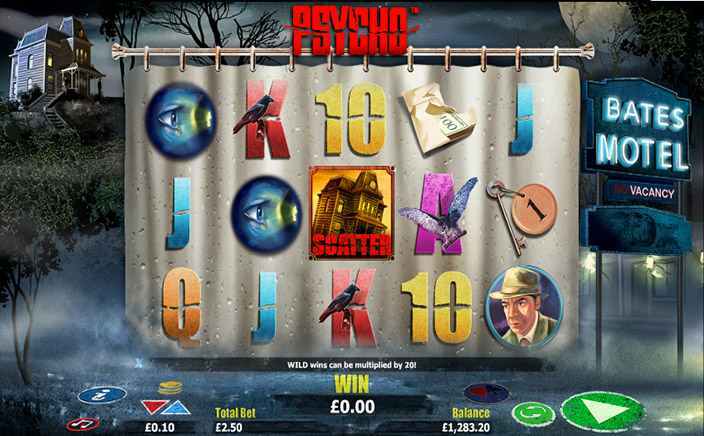 Psycho video slot offers only one bonus game and that is a free spin round. The way of gaining free spins is similar to other video slots, land on 3 or more wonky house symbols and gain 10 free spins or more. Suppose, you land on 4 scatters, you can win 15 free spins and 20 free spins are awarded when you land on 5 scatters anywhere on the reels. Wild symbol plays a vital role during the free spin round. You can tap anywhere and reels will start spinning. In case, you land on the winning sequence of the symbols with the wild symbol, the winning amount is multiplied by 40x. There was a very scary shower scene in the Psycho movie that also appears in the game. You play free spins in the shower scene, where a mysterious figure appears and adds lots of wilds on the reels and thus you win a greater prize. Of course, there is no extra bonus game in Psycho video slot but free spin itself comprises of many luring features. Playing this video slot would be a new experience for you because of its thrilling visuals and audios effects.